My goal in writing is simple. I want to increase Christian’s love for God by increasing their delight in His Word, the Bible. 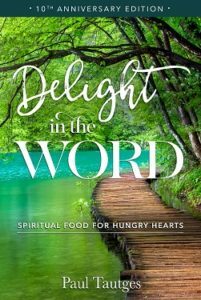 That’s why I wrote my first book, Delight in the Word, and have just released a 10th Anniversary eBook edition. One of the burdens on my heart, and a goal for my ministry, is to convince believers that you cannot separate love for God from love for the Bible. No one can truly love God if they do not also love His Word. Jesus said, “He who has My commandments and keeps them, it is he who loves Me” (John 14:21). By demonstrating how sufficient the Scripture is in addressing the needs of the human heart, I trust that the Holy Spirit will accelerate His counseling ministry in your life and thereby lead you into a deeper, more loving obedience to God (John 16:13). There are at least six reasons why it is spiritually profitable for us to mimic the psalmist’s resolution, “I will delight myself in Your statutes; I will not forget Your word” (Psalm 119:16). Delighting in the Word is a cure for depression. Your testimonies also are my delight and my counselors. My soul clings to the dust; revive me according to Your word (Psalm 119:24-25). When depression strikes (or creeps in unnoticed), we need help from God. In the middle of a thick fog of depression we desperately need the piercing light of divine truth to break through with clear objectivity. So we pray: “Let Your tender mercies come to me, that I may live; for Your law is my delight” (Psalm 119:77).